Residents of Tickle Cove, Newfoundland are challenged to save their community. remote Newfoundland harbour community to attract a doctor. If they could land a doctor then they could convince investors to build a waste disposal facility to provide jobs for locals no longer employed in the fishing industry. As fans of Rick Mercer and 22 Minutes on CBC and going back even further to CODCO, we both love Newfie humour—smart, sharp and usually deftly delivered. Although a bit corny, we enjoyed the movie even though we were the only people in the theatre. It’s getting harder to find movies that appeal to baby boomers. 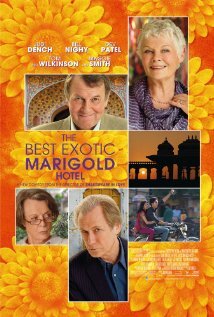 While we all enjoyed Quartet and The Best Exotic Marigold Hotel (based on an even better book called These Foolish Things by Deborah Moggach), movies that our demographic can enjoy are few and far between. Hollywood keeps pumping out action hero movies like Godzilla, X-Men, Transformers, Live, Die, Repeat targeted to the 18-35 age group while a huge category of movie-goers called Baby Boomers are barely acknowledged by the so-called brains in the movie-making business. We may be geezers to them but who else has the financial wherewithall to drop fifty bucks on a pair of movie tickets and grossly over-priced popcorn and pop. We love going to the movies and there are millions and millions of us willing to spend our money at the theatre rather than illegally down-loading them. Zoomer TV’s weekly show on Monday, June 9th on Vision network hosted by Denise Donlon alongside Conrad Black addressed exactly this issue. Wendy Crewson and Mary Walsh were panelists on the Zoomer show and as Boomer Broads they were able to contribute unique insights. I found Mary Walsh’s off-hand comments about The Grand Seduction (in which she had a supporting role) particularly interesting because the whole time I watched the movie something didn’t sit quite right with me and she nailed it. That movie, like most movies produced today was a totally male-dominated piece of work—directed, written by and starring men. Wonderful men for sure but the female characters were totally skewed to a misogynistic stereotype. As Mary Walsh pointed out, the leading male characters completely ignored the fact that strong women are actually the community leaders and initiators of community-building projects in these rural areas. By casting the women in The Grand Seduction as eavesdropping telephone operators and witless seamstresses whipping up white cricket outfits for their men, the movie missed a huge opportunity to let the women’s voices be heard through the genius of actor/writers like Mary Walsh to make the movie far better than it was. This movie combined all the things we like in a movie. Comedies – A good laugh is always uplifting. Romance – Who doesn’t enjoy a bit of sentiment. It gives us hope. Foreign locations – We love to visit foreign locales like Paris, Rome or London for the price of a movie ticket. Contemporary themes – When the plot centers around people our age we can relate. History – Whether fiction or fact, we always enjoy nostalgia. Character study – Getting involved in the lives of complex characters is satisfying and makes for good conversation afterward. A movie like Monuments Men could have been so much better if the writing had not been so trite and cliché. Philomena was wonderful for all kinds of reasons. Clint Eastwood’s Grand Torino is a quiet gem. We loved Bridesmaids for its sharp wit, great physical comedy and intelligent writing. Ditto for The Full Monty. And Dallas Buyers’ Club was just a damn good movie. Do you get the picture? Please answer our call.